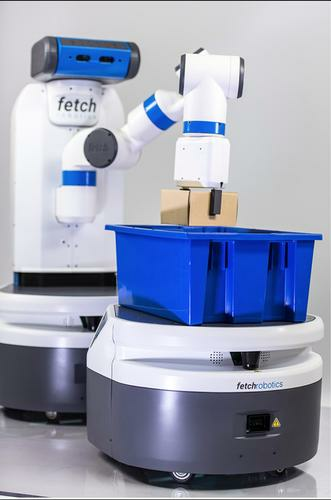 Fetch Robotics' new Fetch robot (rear) can autonomously grab inventory from shelves and place it into the Freight mobile bin robot (front). The machines are designed to work in warehouses filling e-commerce orders. "Because of the pressures of on-demand commerce, there is a critical need for warehouses and fulfillment centers to become more efficient," Fetch Robotics CEO Melonee Wise said via email. "We see our robots as a means to that end." Fetch's new robots are slated to go on display at ICRA 2015, an IEEE Robotics and Automation Society conference in Seattle, Washington, in late May.